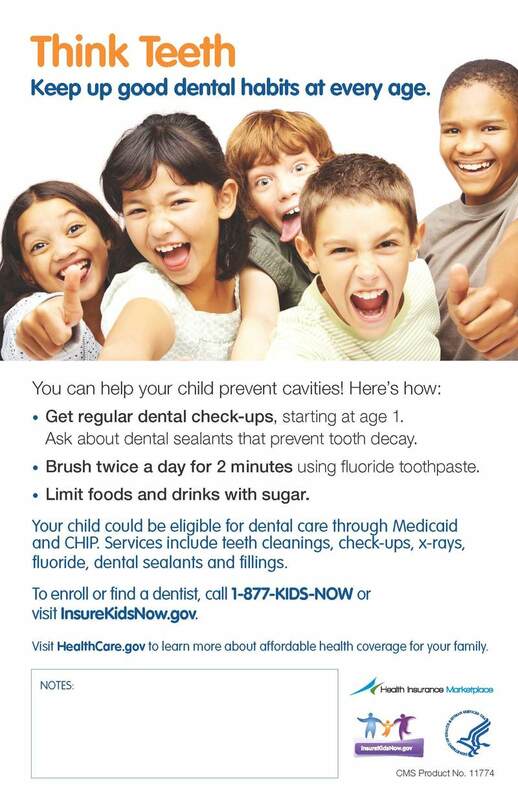 Where can you find posters, handouts and other materials with concise, evidence-based messages for parents about their children’s dental health? Search no more. The Centers for Medicare & Medicaid Services (CMS) has redesigned its “Think Teeth” web page, which offers well-designed free materials to support your Medicaid/CHIP enrollment and oral health educational efforts. You may also customize the materials with your organization’s information and print them yourself. The Think Teeth page has other helpful resources too. A CMS fact sheet helps guide parents of children with special needs on finding a dental provider. The page also provides web banners, web buttons and social media content you can use on Twitter or Facebook. 1. Share the link to the Think Teeth page with your colleagues so they can order free materials. 2. Participate in our Blog Carnival March 16-20 to Feb. 19 at 2 pm (Eastern). We’ll be highlighting these materials and recognizing Medicaid/CHIP’s crucial role as the oral health safety net for children. Our social media kit makes it easy for anyone to participate. Request a copy of the kit by emailing me at rkraybill@cdhp.org. The Children’s Dental Health Project is proud to have worked with Mathematica Policy Research to offer recommendations to CMS on the redesign of its “Think Teeth” oral health web page. Our thanks to the organizations and individuals who provided comment and review during this process.